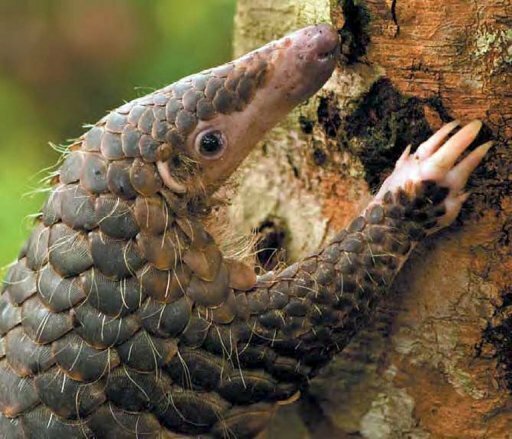 Handout picture released by the World Widelife Fund (WWF) shows a pangolin — also known as a scaly anteater — climbing a tree. Thai police say they have seized almost 200 live protected pangolins, which are prized in China and Vietnam as an exotic meal and for use in traditional medicine. BANGKOK (AFP) – (AFP) – Thai police Tuesday said they had seized almost 200 live protected pangolins, which are prized in China and Vietnam as an exotic meal and for use in traditional medicine. The animals — known as “scaly anteaters” — were discovered on Monday in two pick-up trucks that were stopped by highway police in the province of Udon Thani in the country’s northeast. The small mammals are nearly entirely covered with scales, made of keratin — the same protein that makes up human hair. The scales are sought after in Vietnam and China as a remedy for allergies and to help male potency.